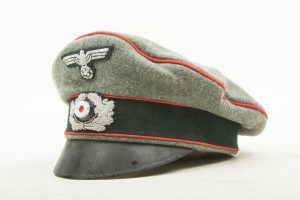 A stunning Sturmartillerie officers crusher visor cap by Alfred Krebs. The cap is in great, near mint condition with most if not all of the nap in the wool. The cap is a nice size 57/58 that would fit most modern mannequins. These caps where modeled after the very popular Alter Art crusher caps but are most probably manufactured later in the war. Unlike normal officers visor caps this cap does not and never had a chinstrap! 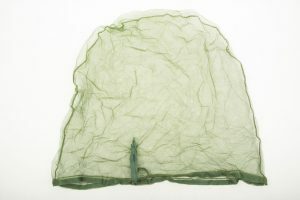 The visor is made of a rigid pressed paper construction. The cap retains both of its bullion insignia of which the eagle is resewn to the piece. Otherwise the cap is in original condition without restorations. The cap has its original label Alfred Krebs Mützen-Werkstätte Halle A/S Gr. Ulrichs. 10 Telefon. 35759. 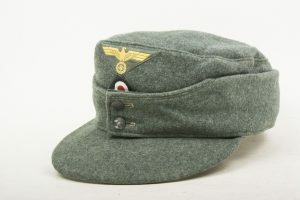 The cap would be a great addition to a Stug wrap display as these caps where highly preferred by armoured vehicle crews. Hard to find cap in great condition! A stunning and mint Heer sidecap which has been upgraded from EM to Officers by hand sewing a thick silver cord to the top. The cap is in mint condition and is a nice big size 60. 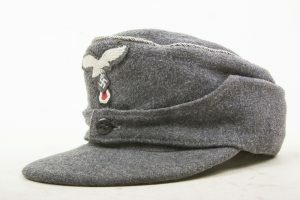 Nicely dated 1940, this cap was manufactured by Hermann Naubert Mützenfabrik Erfurt. 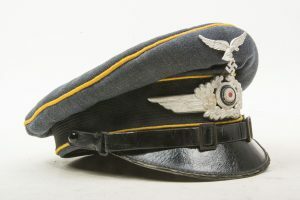 The cap has the dark green Waffenfarbe on the front indicating administration. The cap doesn’t have a eagle, but could easily be restored. This garment was recently discovered in a cloth processing plant and has never been in a collection before! Stunning mint Coastal Artillerie Nicely marked RBNr. 0/0520/0017 indicating production by Hermann Potthoff Coesfeld. 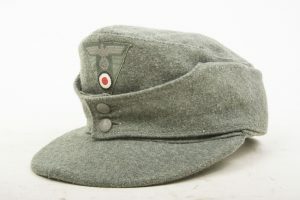 The cap is a exceptional large size 61 and is a textbook example of a Einheitsfeldmütze fuhr Küstenartillerie. 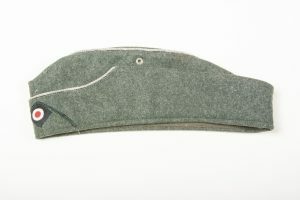 The cap features its factory sewn insignia and full lining. Underneath the cap has a few moth nips, but otherwise its just perfect. Can’t be upgraded!